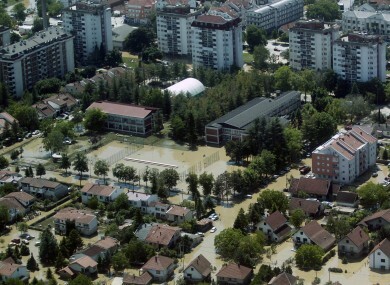 A flooded area is seen in Obrenovac, some 30 kilometers southwest of Belgrade, Serbia, last month. THE REMAINS OF 24 people, believed to be Muslims killed during Bosnia’s 1990s war, were exhumed from several graves unearthed by May’s devastating floods, an official has said. Floodwaters removed a three-metre layer of ground exposing several small graves on the left bank of the Bosna river in southern Bosnia, Lejla Cengic, spokeswoman for the Institute for Missing People, told AFP. During a month-long operation to exhume bodies uncovered by flooding, the remains of 24 people were found in the area between the towns of Maglaj and Doboj, some of the hardest hit by flooding, she said. “Most of the victims had their hands tied around their backs, while several were killed by a bullet fired at a close range to the neck,” Cengic added. The remains are thought to belong to Muslim men from the village of Jablanica, near Maglaj, killed by Serb forces in June 1992, at the start of the war. Their identity will be confirmed by DNA analysis. Torrential rains hit Serbia, Bosnia and Croatia in mid-May, killing 77 people in the Balkans’ worst floods and landslides in more than a century. The disaster forced tens of thousands of people from their homes and caused damage estimated at two billion euros. Bosnia’s 1992-1995 war claimed some 100,000 lives. More than 9,000 people are still missing, official data shows. Email “Devastating Bosnian floods unearths mass grave containing 24 people”. Feedback on “Devastating Bosnian floods unearths mass grave containing 24 people”.